Since establishing the scholarship program, Golden LEAF has provided over 5,300 scholarships to help North Carolinians attend participating NC 4-year colleges and universities. Participating institutions include UNC system universities and NC’s private, nonprofit institutions. Click here for the list of participating colleges and universities. Be a high school senior enrolling full-time as a first-year student or a currently enrolled community college transfer student enrolling full-time at any participating North Carolina college or university in the fall of 2019. Have a Pell eligible Expected Family Contribution (EFC) determined by the Free Application for Federal Student Aid (FAFSA). Have a GPA of no less than 3.0. Communicate a commitment to returning to a rural county that is economically distressed. High school seniors are eligible for a 4-year scholarship totaling $12,000 ($3,000 a year over 4 years). Community college transfer students are eligible for $3,000 a year for up to 3 years. Years of scholarship support are subject to the number of credits transferred and the degree sought, among other eligibility factors. Approximately 215 scholarships will be awarded each year. Visit CFNC.org/goldenleaf to fill out the application form or call 866-866-CFNC for assistance. Your FAFSA, application, and transcripts are all processes through CFNC.org. Please do not send your information to the Golden LEAF Foundation. March 1, 2019 to submit your application, FAFSA, and transcripts. Paid internship opportunities in rural NC communities. 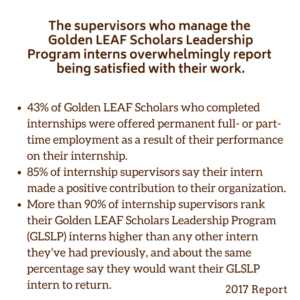 Click here for more information about the Golden LEAF Scholars Leadership program.